We were very pleased to welcome alumni Craig Melvin to the Department during our recent Part 2 ‘Data Visualisation’ project. The Part 2 brief was to create an awareness-raising poster and short animation about some aspect of either ‘Climate Change’ or ‘The Refugee Crisis’. Students presented found data using a combination of graphs, charts, diagrams, tables, maps and infographics. The challenge was to tell a story and find ways of engaging interest whilst being accurate, factual and informative. Craig graduated from our BA course in 2014 and went to work for TDL London, a design agency founded in 2005 by MA Information Design alumni, Oliver Tomlinson. 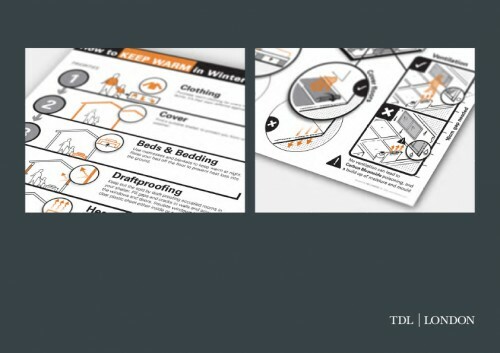 TDL London specialise in using diagrams and design methods to transform information. They use a combination of Process Charts, Explanatory Diagrams, User Journeys, Illustrated Storyboards, Maps & Locations, Data Visualisation and Interactive Diagrams. Craig spent the day giving insightful feedback to small groups of students. He also showed some of his recent work for a refugee charity (pictured below), and told students about his experience of moving on from the Department into the world of work.